Lambeth Music Service is the lead partner of Lambeth Sounds and a founder member of the South Riverside Music Partnership. 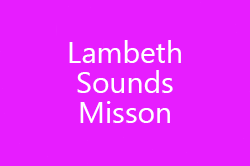 ​The Lambeth Music Service was established in 2001 with a direct government Standards Fund grant. LMS works with the Education Learning and Skills, other education organisations, funding bodies, charities and business partners to provide music education in the Borough. LMS receives core funding from the Arts Council and delivers all four core and three extension roles as part of the National Plan for Music Education.